Alessandro Pallioti, a senior policeman agrees to oversee a murder investigation, after it emerges the victim was once a Partisan hero. When the case begins to unravel, Pallioti finds himself working to uncover a crime lost in the twilight of war, the consequences of which are as deadly today as they were over sixty years ago. Florence, 1943. Two sisters, Isabella and Caterina Cammaccio, find themselves surrounded by terror and death; and with Italy trapped under the heel of a brutal Nazi occupation, bands of Partisans rise up. Soon Isabella and Caterina will test their wits and deepest beliefs as never before. As the winter grinds on, they will be forced to make the most important decisions of their lives. Their choices will reverberate for decades. In the present day, Alessandro Pallioti, a senior policeman agrees to oversee a murder investigation, after it emerges the victim was once a Partisan hero. When the case begins to unravel, Pallioti finds himself working to uncover a crime lost in the twilight of war, the consequences of which are as deadly today as they were over sixty years ago. My wedding dress slid over my shoulders and hips, the ivory satin cool and slippery. It was barely noon, and already a blanket of stuffy air hung above the city, turning the sky a pale, dirty blue. I could feel my hair wilting and sticking to the back of my neck as the seamstress's assistants, a cadre of silent young girls in pink pinafores, fastened the back, their deft fingers working the rows and rows of tiny buttons. When they were finished, they took me by each arm, like an invalid, and stood me on a stool. The parallel stories weave together nicely, and each is intricate and equally engrossing; indeed, I found the book very hard to put down from start to finish regardless of which plot line I was following. Grindle’s characters, past and present, are also brilliant creations - detailed and full of life, without a flat character to be found anywhere in the novel. (Reviewed by Kim Kovacs). While there are distinct flaws in this novel...The Villa Triste is nevertheless an engrossing and thoughtful thriller, plotted more tightly than Houdini's knots, and emotionally powerful. Starred Review. 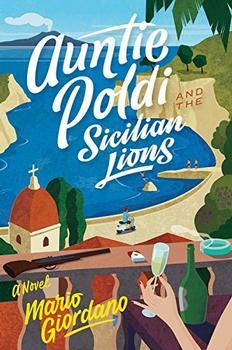 Grindle combines a contemporary mystery with historical fiction in her captivating narrative about Italian partisans in World War II and a modern-day police inspector determined to uncover certain truths. The Villa Triste lacks the verisimilitude that typifies the best of contemporary crime fiction set in the past. We get no real physical sense of Florence itself, either sixty years ago or now . . . Still what it may lack in period detail, it more than makes up for in the sharpness and attractiveness of its characters. Italy's role during WWII can seem puzzling, as the country gave the appearance of switching allegiances more than once during the course of the conflict, at times ostensibly siding with the Axis powers, at others supporting the Allies. This contradiction, though, can be seen as a reflection of a volatile period in Italy's history, as various political factions sought to gain control.